We’ve all seen gorgeous room schemes where the pros have mixed different fabric patterns to incredible effect. How do they do it? 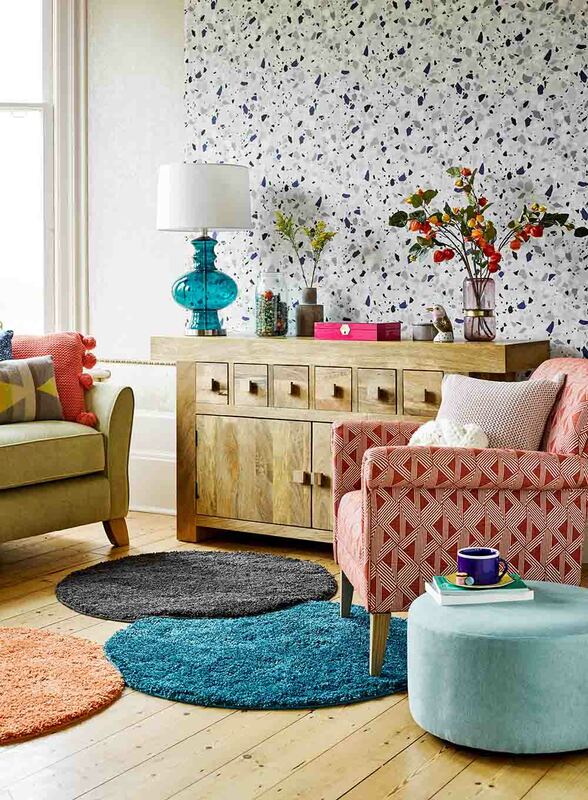 While we might be tempted to just throw lots of patterns into one room, creating a cohesive look may seem difficult. However, I’m here to share a little trick with you to successfully mix patterns just like the professionals. 1 organic pattern + 1 geometric pattern + 1 solid or very small scale pattern or something with texture = the easiest pattern mix. 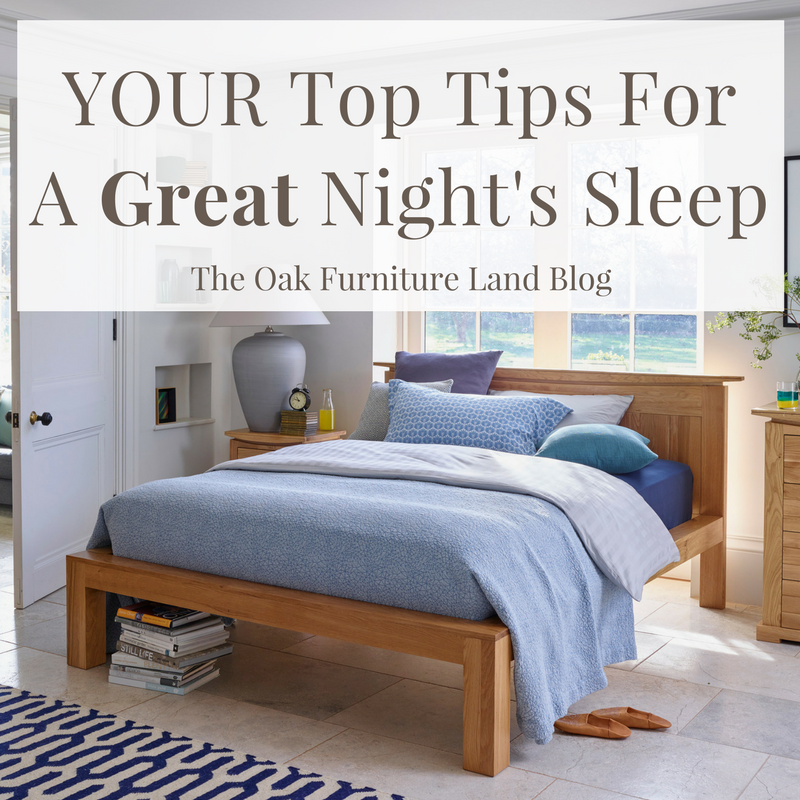 So, let’s break it down first and we’ll see how to apply the formula to a few of our favourite pieces here at Oak Furnitureland. An organic pattern is one that depicts nature in some form like trailing leaves, birds, butterflies, flowers and the like. A pattern that is more graphic in nature so things like dots, stripes and repeating shapes which create a higher contrast. How do you mix florals with other patterns? 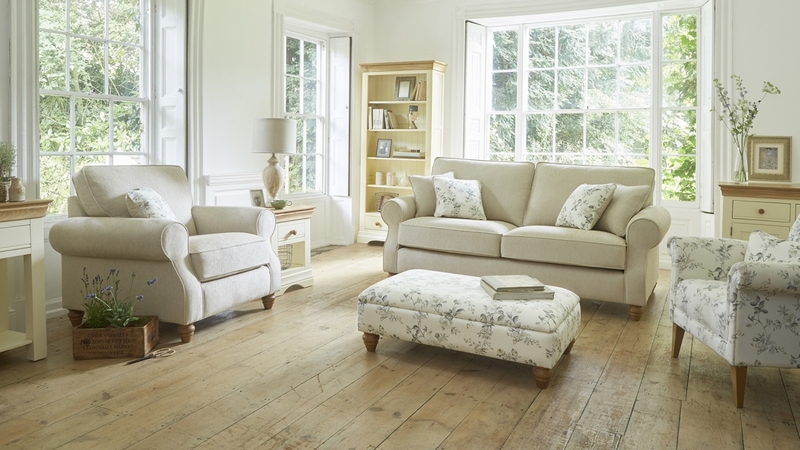 For our first example, here’s how we’ve combined fabrics with our Amelia Armchair in Rippon Natural, using two different colourways based on the pattern. As floral fabrics would be considered an organic pattern, the easiest way to combine them is with a geometric pattern. 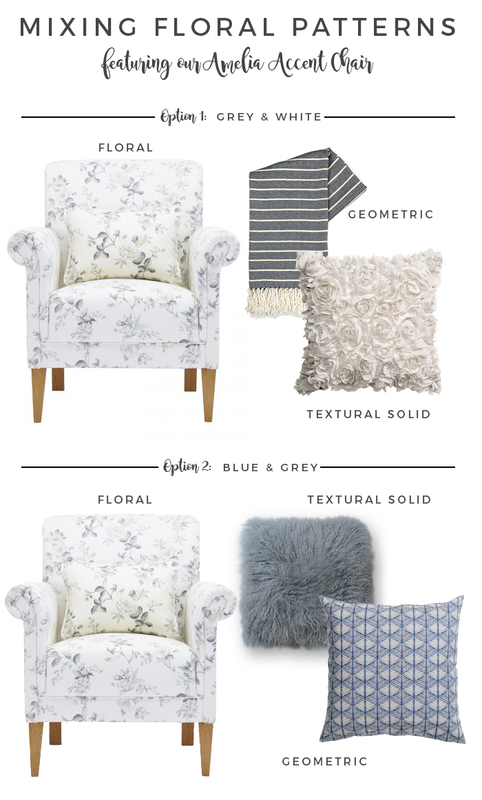 It’s generally easier to choose the floral fabric first, then find your geometric pattern and finally, a compatible solid fabric (ie, no pattern at all) or something lovely and textural in a solid colour. 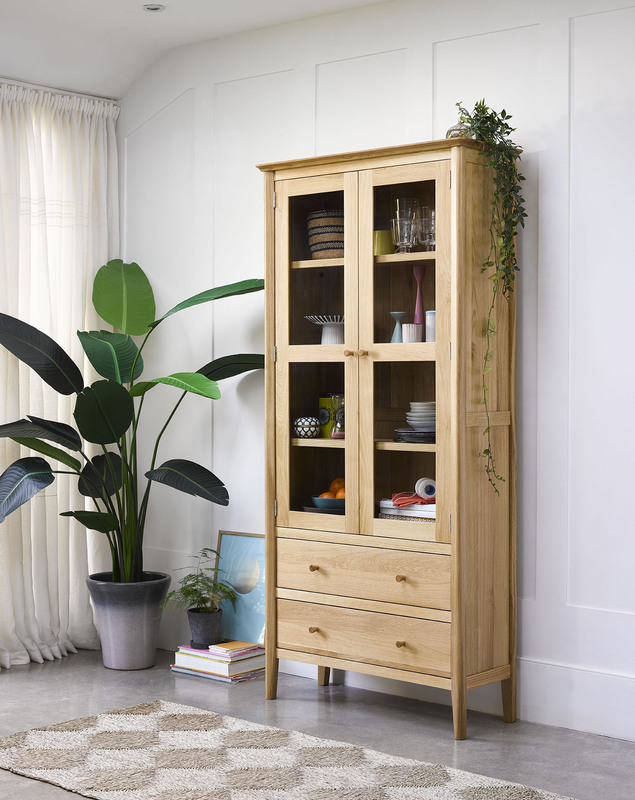 The secret to the successful mix is once you have your organic pattern, try not to include any other kind of floral, trailing patterns or leaf prints or anything else that would be considered organic in style as they will end up competing. Why should I worry about scale? When choosing your patterns, it’s important to pay attention to the scale of your pattern – is it large pattern that grabs your attention? Or is it so small that from far, it almost looks like a solid colour? Your medium patterns will fall somewhere in between these two. 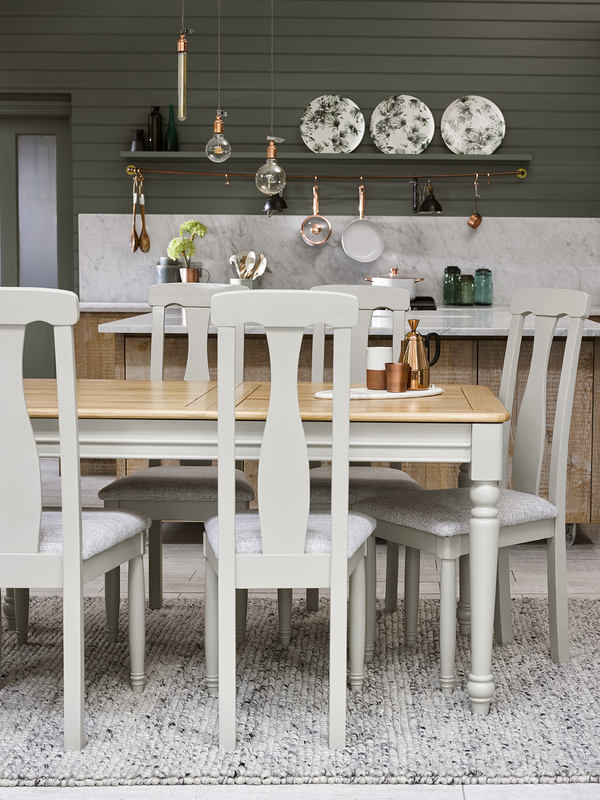 The reason you want to mix up the scale (the size of your pattern repeats) is because two really big or medium scale patterns next to each other will compete for attention and the final look may seem a bit chaotic. You’ll want to vary the pattern sizes so that you’ll end up with one large, one medium and one small and by doing this, you’ll know they aren’t clashing in the space. 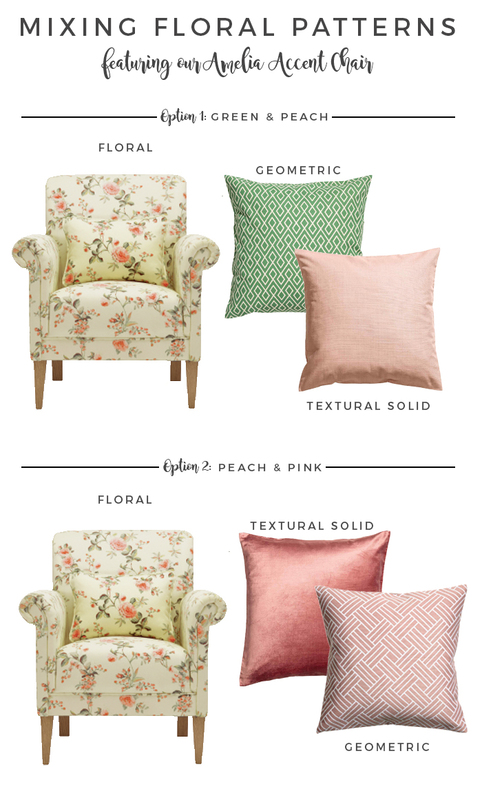 In our second example, here’s how we used the formula with our Amelia Armchair in Rippon Rose, again, using two different colourways based on the pattern. 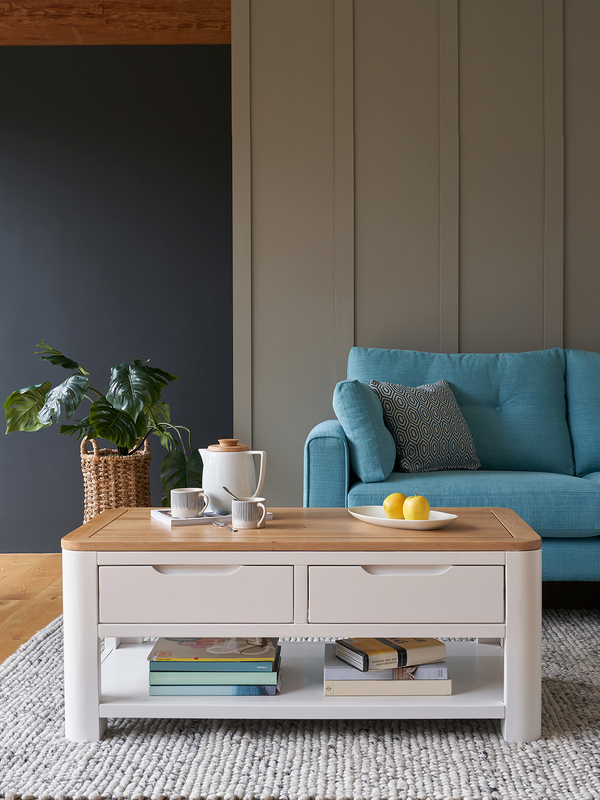 Be mindful of your colour palette to make sure all your patterns work together. The easiest way to do this is to use the colours within the floral pattern as a guide to know what colours will successfully coordinate with it. If you introduce a different colour, be sure it’s picked up in the other fabrics to create a small palette of 2-3 colours. 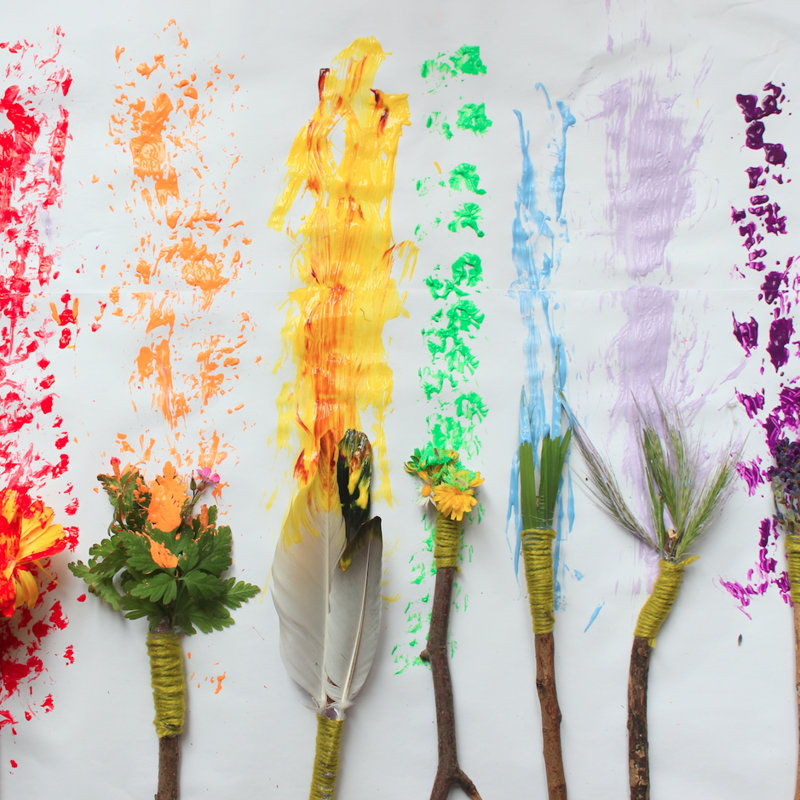 Using 4 different colours will be trickier to pull off but for the brave, it can be done! If you are just starting out, then 2 or 3 will probably work best. 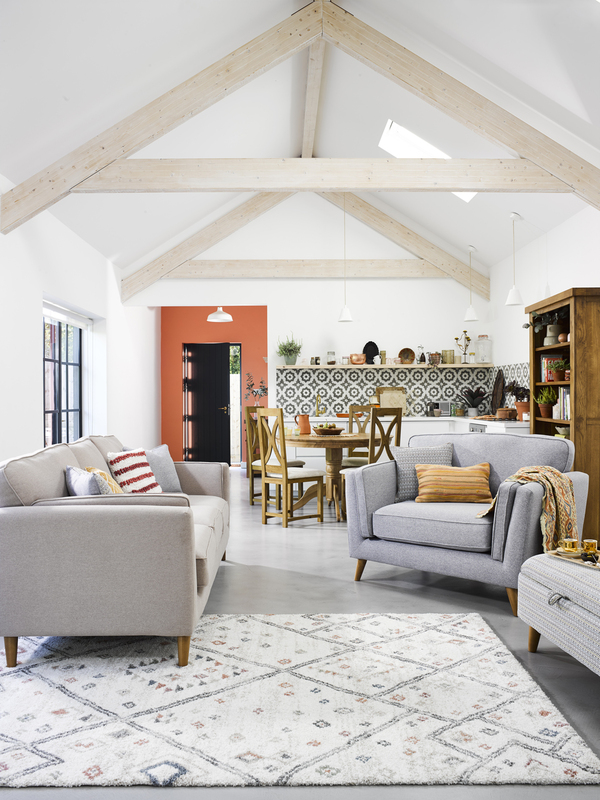 Simply choose a geometric pattern based upon one of the colours in your floral fabric and then, choose a solid or textural solid fabric within the same palette to ground the whole scheme and give your eye a place to rest. 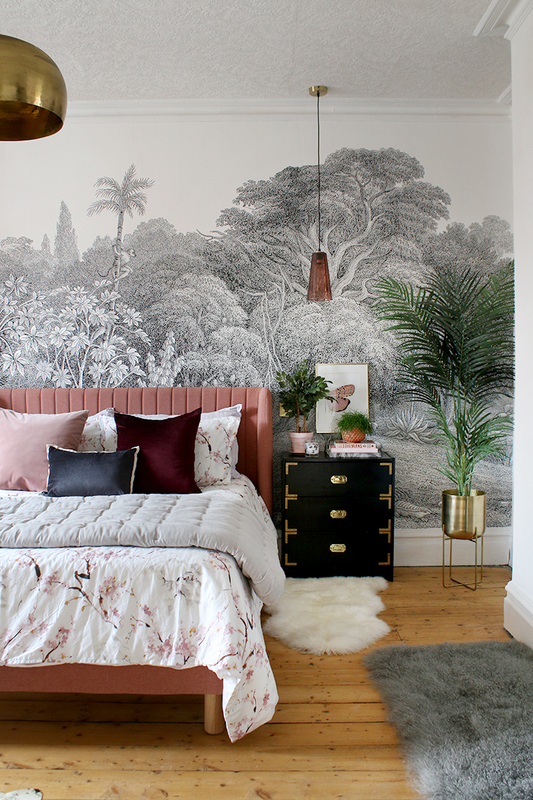 Remember, too many bold patterns and too many different colours may result in a combination that is overwhelming and unsettling so choosing a solid or a really small scale print is best as your final addition. And finally, you don’t have to start with the floral pattern if you’d rather not. 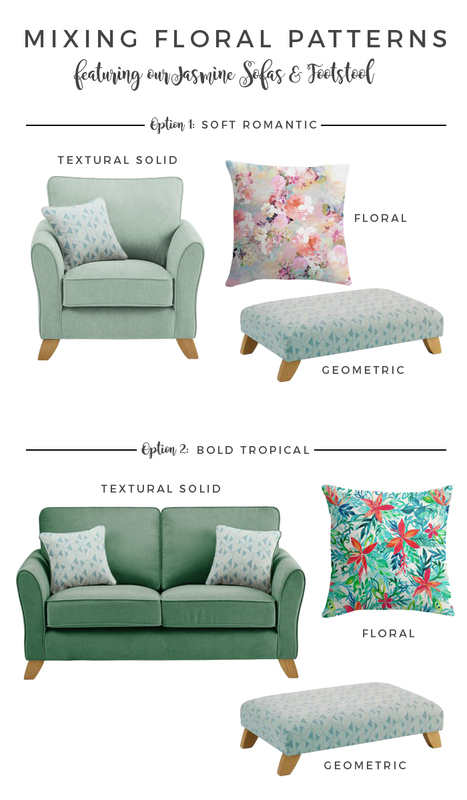 Here’s how we combined our Jasmine Sofa, Chair and Footstool in a geometric aqua print, then chose the floral patterns which result in completely different looks. So as you can see, mixing patterns like the pros isn’t too difficult at all! Which is your favourite combination? 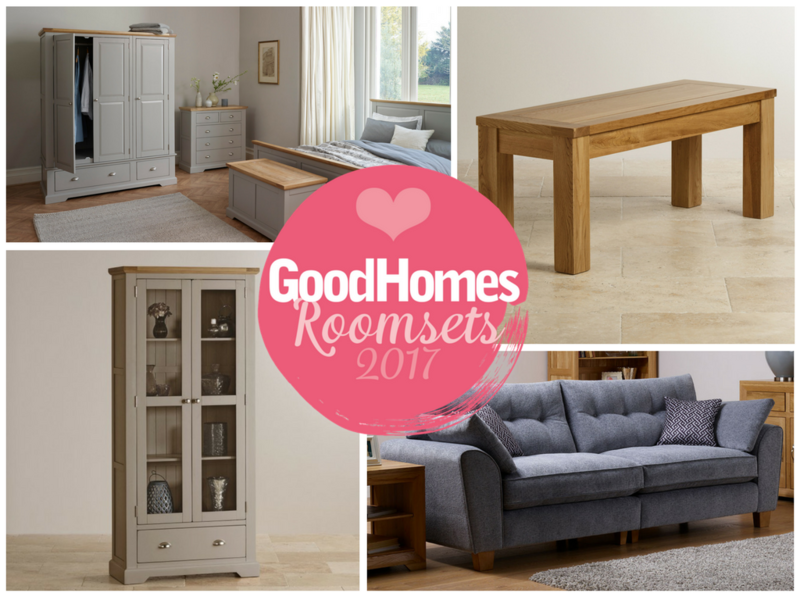 Packing our bags for the Ideal Home Show!